The Liebherr 2018 Men’s World Cup, the event returns to France, the event returns to Paris but to a venue that has not previously been the host; the destination is the Disney Event Arena in Chessy, a suburb in the east of the city. Play commences on Friday 19th October and concludes on Sunday 21st October. Once again France is the host, the country that broke the mould. First staged in 1980 in Hong Kong when China’s Guo Yuehua emerged as the winner, the Men’s World Cup was never staged in Europe until 1995 when Nîmes was the host city; it was an age when Jean-Philippe Gatien was very much at his peak, the idol of France. In 1992 he has been the silver medallist at the Barcelona Olympic Games, the following year in Gothenburg he was crowned World champion. In 1995 in Nîmes when in those days playing best of five games, five services before changing and games to 21 points, when he beat China’s Wang Tao at the quarter-final stage he brought the house down; you could hear yourself think; such was the level of adulation. 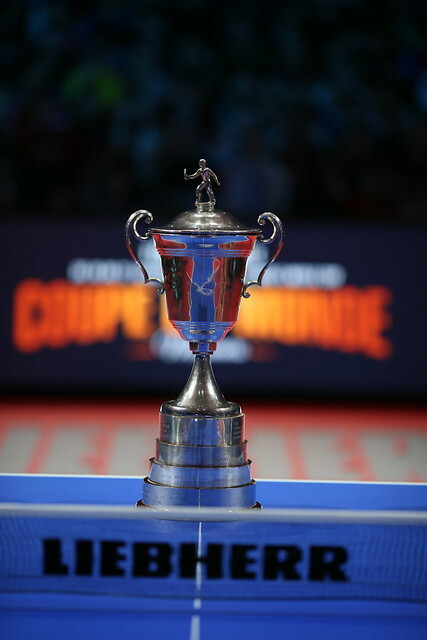 One round later he was to lose to China’s Kong Linghui, the eventual winner and at the time the reigning World champions, Jean-Philippe Gatien was beaten in five games by one of the most complete players the sport has ever witnessed. Nîmes was to play host for a total of three years in succession before the tournament returned to Asia, in 1998 Shantou was the home. The tournament, with the exception of Courmayeur in 2001 remained in Asia until 2005 when the Belgian city of Liège bid welcome. Ever since that date, in total contrast the first 15 years of the event, the home for the prestigious annual event has always been Europe. The 39th edition, the fact the tournament is being held in France means that now Europe has hosted the event the same number of times as Asia; each has been the host 18 times. The exceptions are Barbados in 1983, Trinidad and Tobago in 1986 followed by the Kenyan capital city of Nairobi in 1989. Meanwhile, France, having now hosted the event six times is second in line only to China, the destination on nine occasion; whilst Paris having previously staged the tournament in 2006 and 2011 is now alongside Kuala Lumpur and Liège as favourite city.